Connecting to other articles of solar power harvesting fabrics for sun management outside I found an interesting design concept for sun light management indoors. The Energy curtain designed by Anders Ernevi, Margot Jacobs, Ramia Mazé, Carolin Müller, Johan Redström and Linda Worbin at the Interactive Institute, a Swedish experimental media research institute that combines expertise in art, design and technology. 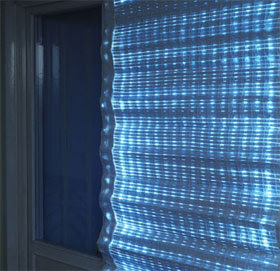 The Energy Curtain is a window shade woven from a combination of textile, solar-collection and light-emitting materials. During the day, the shade can be drawn to give shade and to limit the heat coming inside a room and during the evening, the collected energy is returned as a glowing pattern on the inside of the shade, illuminating the room with the excess light blocked out during intensive sun shine. Such design is another win-win solution, using a everyday object, adding soft solar panels on one side and integrate soft textile illumination elements on the other side. As with many other of such fabulous creative ideas – the commercialization is lagging behind. The advantages of the Energy Curtain design is very obvious I do not understand why this design has not been picked up yet for commercialization. Maybe another gap in the value chain of (very) smart textile designs? Maybe these great design ideas do not make it into the awareness of potential companies or investors to take it and had with it to the market?